HA703.5	 GITA-70 70 3.50	 2.60 23	 500	 36	 1470	 ±2.5 @ 1450°C	 Working lining of steel ladle up to 60 T capacity, Cement Rotary Kilns. HA802.0 GITA-80 80 2.00	 2.80	 20	 600	 38	 1600	 ±2.0 @ 1500°C	 Working lining for RF/VAD/VOD, cooler of cement Rotary kiln. 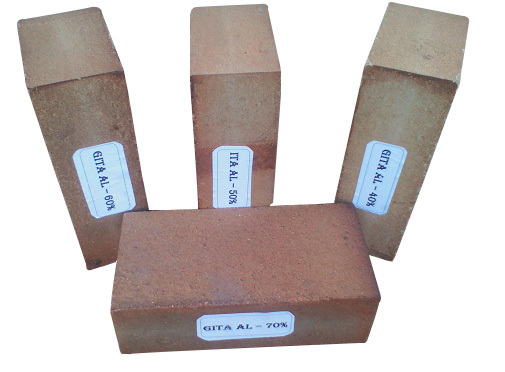 High Alumina CHM Bricks for Non-Ferrous Industry – High-alumina Refractories are made from bauxite, a naturally occurring material containing aluminum hydroxide (Al[OH]3) and kaolinitic clays. These raw materials are roasted to produce a mixture of synthetic alumina and mullite (an aluminosilicate mineral with the chemical formula 3Al2O3 · 2SiO2). By definition high-alumina Refractories contain between 50 and 87.5 percent alumina. They are much more robust than fireclay Refractories at high temperatures and in basic environments. In addition, they exhibit better volume stability and abrasion resistance. High-alumina CHM bricks are used in blast furnaces, blast-furnace stoves, and liquid-steel ladles. Our Experts has created this 6 Proven Methods to select the Right Refractory for your Requirement. Please check at our Blog – Selecting Right Refractory.